#52: Painting a Photography Backdrop….An Emotional Journey! What does a girl do on a dreary winter day? Attempt to paint a photography backdrop (background) of course. For several days now, I have been watching my extremely talented photography friends and colleagues worldwide, attempt and master the art of painting a photo backdrop. Many have posted very helpful posts describing the process and shared their knowledge. Reading all these, I was excited. It felt and looked like something I could attempt. Below is description of my journey, which had many ups and downs in emotions and taught me several things along the way. Having completed my first backdrop, I would say I am glad I attempted it. I learned a lot and will definitely try another one utilizing all the things I learned on this one. Here is the final look. Colors are so so….but I think I now know how to make one. I bought a 9×12 medium weight canvas backdrop at Home Depot for about 14 dollars. It worked great and I wouldn’t change a thing. 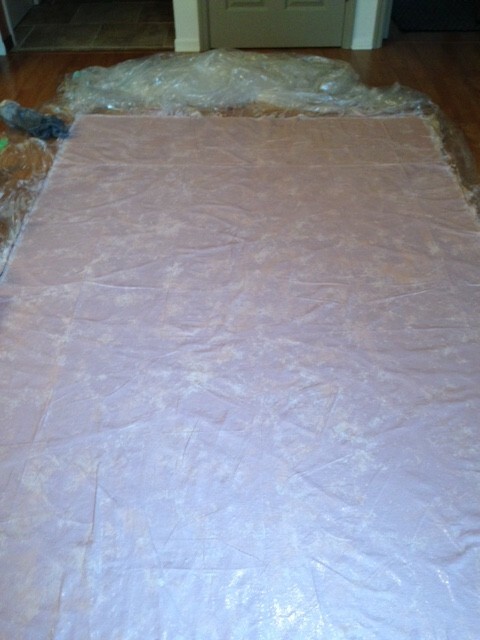 I cut it in half and it will allow me to make TWO backdrops from it. Great! For the first time in my life, I heard of the term OOPS PAINT. I was floored. Every paint and hardware store carries something called Oops Paint. It is mis-colored paint and they sell them very inexpensively. In fact, the cheapest was at Menards..$1 for a quart and $2 for a gallon. How exciting. I bought a BUNCH of colors and headed home. Key Learning: Just because it is cheap paint, don’t just get any color. You still have to plan coordinating colors. I definitely did not do a great job in picking colors. Will be more careful and coordinated next time. Put a good amount of plastic sheets below and around your painting area. If you are lucky and can take this outdoors, all the better. 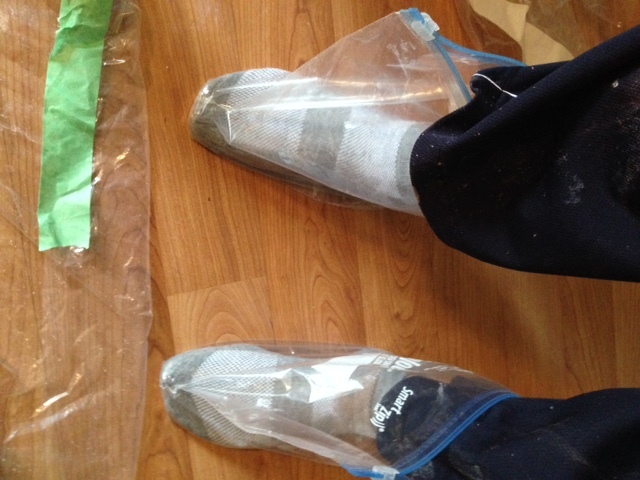 I used plastic sheets, gloves, good old Ziploc bags as booties (I could zip them close to my ankle) and put on my favorite pair of painting pants. Aaah. Here is where the tenseness started. Do I roll on the paint? Do I sponge it on? Do I wait for the first layer to dry and then paint the second? Do I just paint when everything is wet? Do I paint lightest to darkest color or darkest to lightest color. Aaaaah. Then I panicked. First I sprayed water throughout the canvas and made it quite moist (this was a good decision). 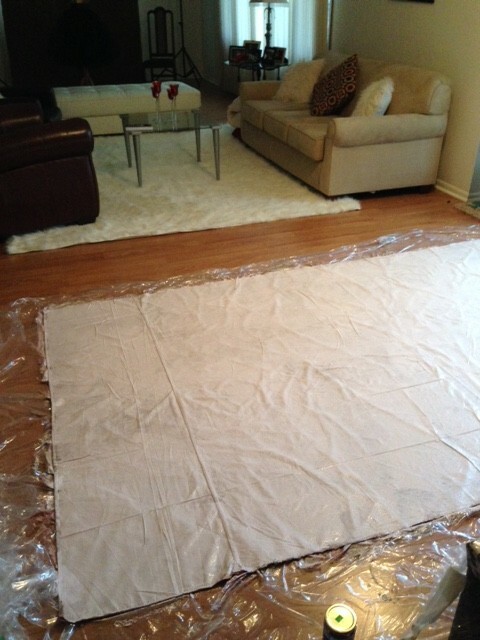 Then I rolled the lightest color paint using a paint roller. THEN I MADE A MISTAKE! I chose a horrible purple and started “splotching” it on using the sea foam. Yikes. Two things were happening. I hated the color and the sponge wasn’t working for me. I was frustrated….and even went into despair. Oh no…what did I start. Then thankfully I stopped and reached out to my ever-present digital support group. I asked them to help me by walking me through this process. Right away, some folks jumped in and helped me out. More importantly, they encouraged me to keep going. Its only paint..they said. Keep going…they said. The third color will bring it all together…they said. All true. I am so grateful for friends like this. They were right….I painted again over the bad color and kept going and finally I did like the end product. Lessen Learned: Do not panic. It’s only paint. I used a crumpled up plastic bag to splotch paint on to the wet surface. I abandoned the sea foam sponge and was happy. If the surface felt dry, I just sprayed some water on that spot. Also, I think next time I will try to go first with the darker color, then the medium color and finally highlight with the lightest color. Boy was this an emotional journey. I went for excitement to anticipation, to focus, to frustration to disappointment to panic to dejection….then to hope to satisfied to looking forward to doing it again. Aaaah. I couldn’t have done it without my friends. Thank you all. Hope this post helps someone start THEIR background painting. I sure can’t wait to paint my next one. I will actually buy the right set of colors! Tomorrow, I will post a picture using my backdrop. This entry was posted in Backdrops, Indoor Studio, Photographer Notes.